A popular Baroque castle with a large French park and a pheasant coop. For visitors there are many cultural events and exhibitions from the 17th - 19th centuries. Children will appreciate the possibility to rent historical costumes. The Baťa Canal is currently only used as a tourist waterway. No freight boats operate in this canal anymore. Small vessels with an up to 20 kW engine capable of a maximum speed of 12 km/h can be sailed without permits. This means that a person over the age of 18 can drive a vessel without a special permit or license, having only received basic instructions at the rental company. The length of Baťa's canal (from Otrokovice to Skalice) is currently approximately 53 km. Some sections follow the river Morava, elsewhere they go along artificially excavated canal sections. The difference in heights on this waterway is balanced by the boat locks. The depth of the Bata Canal is 1.5 meters on average. Regular cruises on large cruise boats or houseboat stays are also very popular. The Museum Village of Southeastern Moravia is an example of the folk architecture of the individual regions of Slovácko. You will find more than 60 interesting objects on an area of 16 hectares in a beautiful and calm environment. Folk architecture from the 18th century, examples of original construction methods, folk crafts, traditional farming, animal husbandry, history and the development of winemaking, programs for children, thematic events. National Historic Landmark. In the 8th and 9th centuries, the Great Moravian castle with a large castle village on the river islands in Morava river. An important place for the beginnings of our statehood. A place possibly connected with the Slavic diviners of St. Cyril and St. Methodius. A place called Morava (grad Morava) or the ancient town of Rastiovo (urbs antiqua Rastizi). Foundations of the princely palace and 12 stone churches, burial grounds, remains of a mighty wall, wooden stake bridges. Permanent archaeological exhibition. Skařiny Nature Reserve, the meanders of the Morava River, the beauty of fauna and flora. Cultural events for children, youth and adults. Velehrad is one of the most important places of pilgrimage in the Czech Republic. The pride of the parish is the Baroque basilica with adjacent buildings of the former Cistercian monastery. Velehrad is an important spiritual center, a place of frequent ecclesiastical pilgrimages, rallies and Cyrillo-Methodian celebrations. The main Cyril and Methodius pilgrimage takes place on 5 July on the Feast of Saints. 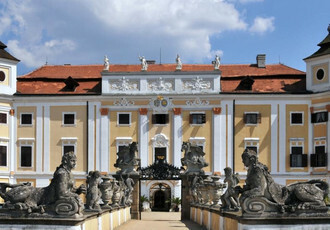 Buchlovice Castle is one of the most important Baroque noble settlements in the Czech Republic. The quality of architecture, extensive collections, renowned owners and importance in the history of the last years of the Habsburg monarchy make the castle a place of significance far beyond the borders of the Czech lands. Buchlov is one of the oldest castles in the Czech Republic. Its beginnings are dated to the first half of the 13th century. The significance of the castle lies above all in the unique preservation of the original architectural elements of individual buildings. The never-conquered fortress is also a demonstration of the transformation of the austere Gothic castle into a comfortable Renaissance mansion. Buchlov Castle is the most prominent landmark of Moravian Slovácko and together with St. Barbara's Chapel forms the leisure and cultural environment of this area. The palace is one of the most visited monuments in our country. The Neo-Gothic reconstruction in the 19th century created a romantic mansion surrounded by one of the largest European parks (almost 200 hectares) where visitors can find a palm greenhouse, a Venetian fountain, a Roman aqueduct, a Chinese pavilion, a minaret, and an artificial ruin, Jan's Castle. Due to the unique connection of building monuments with the surrounding man-made nature, the entire Lednice-Valtice area was included on the UNESCO World Heritage List in 1996.